Description: For a sophisticated look that will add cool appeal to any space, Antencio is designed with a Travertine Idalight diffuser which is complemented with hardware and accents featured in a Mahogany Bronze finish. 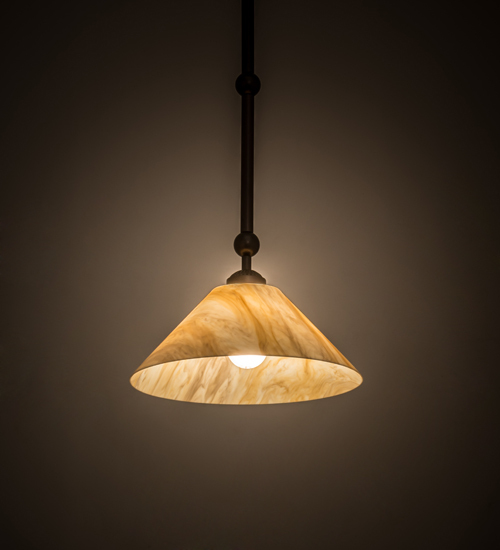 The transitionally styled, cone shaped fixture is perfect for enhancing corridors, lobbies, living and dining rooms, and other areas in both residential and commercial environments. This pendant is crafted by the highly skilled hands of artisans in our 180,000 square foot manufacturing facility in Yorkville, New York in the USA. Custom styles, sizes and colors are available, as well as dimmable energy efficient lamping options such as LED. The fixture is UL and cUL listed for damp and dry locations.